A couple of weeks ago, some may recall that I posted about some of the weird things pharmaceutical representatives will sometimes send to doctors. 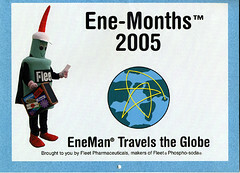 One of these things is EneMan, the mascot for Fleet Pharmaceuticals. To recap, he is a "superhero" character whose duty is to promote colorectal screening for cancer (although how a guy dressed up in a giant enema costume--perhaps the most embarrasing job I can think of--accomplishes this, I have no idea). In any case, I promised to post examples from the 2005 EneMonths Calendar. Here, without further ado, is the front of the calendar and the picture from January. (Click each thumbnail above to see EneMan in all his glory.) More will follow, generally on the first or second of each month. Enjoy. You think EneMan has the most embarassing job? Think of his partner, the guy who _gets_ the enema! 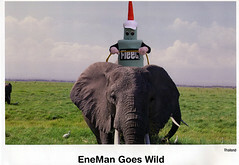 Well, we know that January shot's photoshopped, because you don't use reins on an elephant. So maybe this person didn't actually have to go all around anywhere dressed as a Fleet's enema. I'm trying to figure out how desperate or well paid I'd have to be. Actually, the hardest part would have to be not breaking down in helpless giggles every ten minutes. And that would be too much like a carbonated enema, which is a kink I might just have invented.